JOINT BASE LEWIS-MCCHORD, Wash. -- "Being a sniper is not a job, it is a lifestyle," said Sgt. Charles Gifford. Gifford and Staff Sgt. Daniel Grogan, both from 1-2 Stryker Brigade Combat Team, represented the 7th Infantry Division at the 2018 International Sniper Competition, dueling against 29 teams from around the world to identify the best sniper team during the week-long competition at Fort Benning, Georgia, Oct. 15-19. 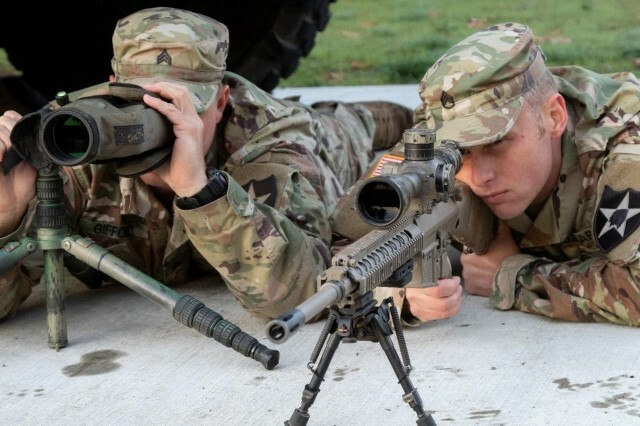 Working together as a sniper and spotter team, the duo from the 1st Battalion, 23rd Infantry Regiment placed second amongst the U.S. Army division teams and 13th overall during the competition, their mettle tested through a series of sniper challenges including long-range marksmanship, reconnaissance and reporting techniques, and their ability to move with stealth and concealment. Being a sniper is no easy task, said Gifford, a Converse, Texas, native. Snipers have to retain large amount of technical information, which is why many constantly go back through their notes and fundamentals. "For me, I really looked forward to learning what I (could) from the other U.S. military and foreign teams," said Grogan, a native of Lancaster, California. "It is interesting to see the different (tactics, techniques and procedures) and training points. This is especially true for the foreign teams, who are good at thinking outside the box." 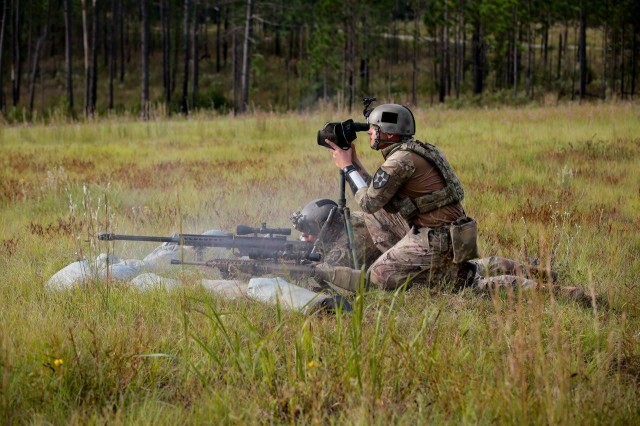 Any sniper training enhances readiness, said Staff Sgt. Christopher McKaig, one of the team's coaches. "The more they do something the better they become as a team. They focused and refined their fieldcraft, marksmanship, range estimation, target detection, and dialogue between one another." An individual sniper does not know everything, McKaig added. They all take that stance when it comes to learning as they are always evolving their training. There is always a sniper thinking of a better way to do something. "You can never get complacent, you always have to be honing your skills," Gifford added. "Part of that is going back to the basic things you learned about the subject as well as the cutting-edge stuff you were just taught." And that is one of the best parts of being a sniper: teaching people the basics, Gifford said. He likes teaching the younger enlisted about the job - everything from aiming techniques to firing positions. "You need to be able to think in ways you are not used to," Grogan said. "Every time we go through a trial period to pick up new candidates, we are looking for people who are smart enough to take in a bunch of information, process it, and apply it. Intelligence and physical fitness are important components for sniper teams. There are a lot of physical, grueling activities that we have to go through in our line of work." Gifford knew he wanted to join the Army after seeing his father return from a deployment. "I remember seeing the taxi behind him and I thought, 'that is what I want to do,'" he recalled. "I knew exactly what I wanted to be." Being a sniper seemed the natural route, said Gifford, who has been in the Army for three years. He remembers shooting with his father, looking in the optic of a scope and being fascinated with it. Grogan joined the Army seven years ago to be a good influence for his family, but he always wanted to be a sniper. There was a Hollywood-type mystique about it. When he was in-processing at his first unit at Fort Bliss, Texas, he met a sniper who encouraged him to tryout. "Back in 2012, I tried out for the sniper section," said Grogan. "I got picked up once I made it through the tryouts and since then continually train to enhance my skillset." Being on a sniper team is different, said Grogan. Everyone on the team has a hand in the planning process. Whenever his sniper teams would get attached to the other line companies, they would bring the lowest ranking guy of the team to meet the commander and plan. It is more about understanding the skills and experience a sniper team has to offer. "There is also a sense of camaraderie and brotherhood being on a sniper team that you don't get anywhere else," added Gifford.